Review: "Katagory V: The Rising Anger" - Sea of Tranquility - The Web Destination for Progressive Music! Not too many heavy metal bands hail from conservative Utah. But when one with the majesty and power of Katagory V does emerge, look out. More compelling, polished and accomplished than 2004's A New Breed of Rebellion, the band's third album, The Rising Anger, should catapult Katagory V to the top of Nightmare Record's burgeoning roster of distinct power/progressive-metal bands. In Lynn Allers, the band boasts a vocalist who can, without question, be compared to Bruce Dickinson and Geoff Tate. And his falsetto? Classic. Allers is backed by dual guitarists Curtis Morrell and Marc Hanson, who must have been raised on the righteous riffs and power chords of vintage Eighties metal, while the rhythm section of drummer Matt Suiter and bassist Dustin Mitchell pounds these 10 tracks into your psyche. Highlights include the rousing opener "Liberated Minds," the dramatic "Will You Remember," the mid-tempo scorcher "Leave Us Behind" and the militaristic closer "Risk and Sacrifice" � all of which recall Iron Maiden, Queensryche, Iced Earth and Nevermore. Katagory V doesn't sound angry, as the CD's title implies, so much as it does extremely confident (but not cocky). The band's thick sound is powered as much by aggressive assault as it is by melodic muscle, and these guys don't waste their time (or ours) with filler tracks. 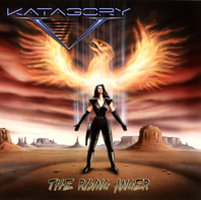 Mastered by Nightmare Records' honcho Lance King (Pyramaze, Avian, ex-Balance of Power), The Rising Anger propels Katagory V to the forefront of America's next progressive/power-metal movement.